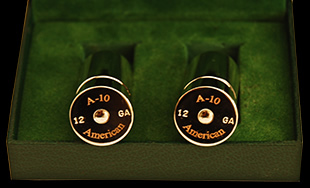 Only the finest products can appropriately compliment your A-10 American™. Below are handpicked accessories including cases, cleaning sets, snapcaps, and leather pouches that are more than worthy of accompanying your A-10 American™. For more information on any product, click on the desired picture below. The very best presentation English style Oak & Leather case. This is the finest Oak & Leather case available at any price. Made of one piece brown cowhides. Leather straps, brass hardware and key lock. Ebony internal corners and all external corners are solid brass. Traditional deep maroon colored wool felt, stitched leather wrist strap with buckle, compartments for accessories, cleaning rod, square oil bottle, and two snap caps. Comes with barrel and stock reducers that can be cut for the exact fit. 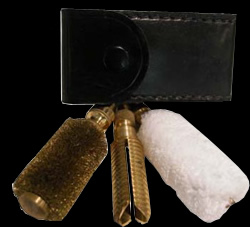 Cases ordered with accessories include a two-piece cleaning rod, nickel oil bottle, two nickel snap caps, and a leather pouch with a mop, split jag, and brass brush. 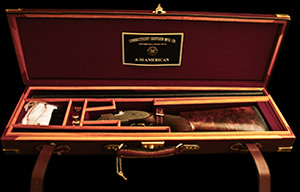 This case is suitable for the finest gun in the world. This price includes a very heavy canvas cover with leather corners and piping. These are not just decorative they are designed to protect the leather. Please specify gauge. Single case is approx. 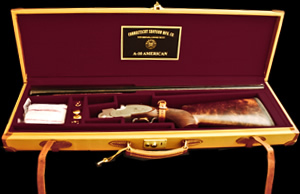 33" x 10" x 3 3/4"
The highest quality leather gun case. Hardwood frame, leather stitched through wood, genuine wool felt interior. These parts are not glued, all the stitching penetrates the wood, to protect the gun. This case is made to last as long as the gun. This is the same case that is offered on all best guns. All cases include a very heavy canvas cover with leather corners and piping. Made of one piece light brown cowhides. Reinforced leather corners, leather straps, with brass hardware and key lock. Interior: The stitching penetrates the wood frame and leather creating a strong bond - no glued corners. Traditional deep maroon colored wool felt, stitched leather wrist strap with buckle, compartments for accessories, cleaning rod, square oil bottle and two snap caps. These deluxe slip in canvas cases feature a very heavyweight canvas exterior with leather trim and handles, and a heavily padded interior for extra protection. This is not your ordinary slip in gun case. Comments that we have had from many noted gun authorities are; "There’s finally a case not just to carry your guns but to protect your guns." 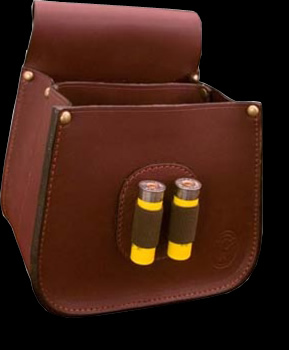 Best Gun Cleaning Kit- Our highest-quality cleaning accessories in a handsome solid walnut box with brass hardware. Fitted in a dark green liner: round nickel oil can; square nickel oil can; round nickel Vaseline jar; rosewood cleaning rod with gold plated caps, two dark pouches carrying a brass split jag, wool mop and brass brush. Case measures 15" x 5" and is 3 3/8” deep and weight: 3lbs 5 oz. 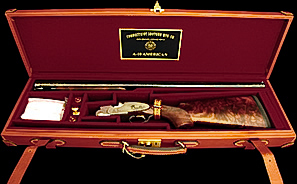 Deluxe Accessory Kit Full accessory walnut presentation case for 12, 16 and 20 gauge guns. 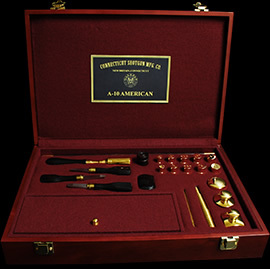 Includes gold plated snap caps, firing pin canister, chamber length gauge, chamber brush, knurled rosewood turn screws, two gold plated oil bottles, gold plated Vaseline jar and cleaning accessories. 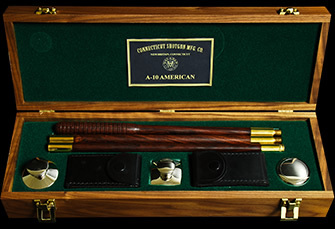 The deluxe rosewood/ brass cleaning rod has a 12 bore choke gauge and screwdriver incorporated in handle. Case measures 16 ¾" x 9" and is 2 ¾" deep and weighs 11 lbs 5 oz. Three Piece Rods - Assembles to a full 33" long (longest section is 11 1/4". Thread size: 9/32"
3 ½" high x 1 ¾" wide x 1 ½" deep, containing one brass split jag, one wool mop, and one brass brush. Highest quality, superior workmanship, heavy construction, rolled edges and corners with brass hardware. Adjustable canvas carrying strap. Will accommodate multiple boxes of shells. This is the finest quality bag we have ever encountered and were able to offer. Red suede interior. Made of very supple deer and goat skin. Leather provides the ultimate in comfort and performance, made in 4 different sizes and available in both left or right hand versions. 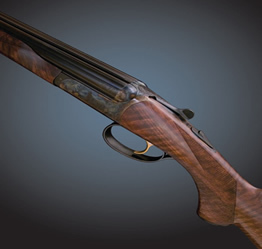 The gloves are close fitting, providing an excellent grip with a sensitive tactile touch to the gun. Breathable construction assures your comfort by keeping you cool in the summer and warm in the winter. 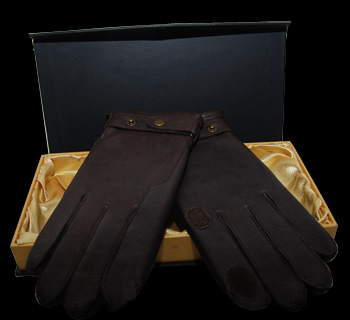 The gloves afford protection to the gun metal and wood against hand oils and acids and help protect against scratches. In addition to protecting the gun, the gloves also protect your hands from abrasion and other extreme elements encountered in the shooting sports. Each pair is packaged in an elegant gift box. After many years of searching we have found the finest shooting glasses available. These glasses feature a precision made metal frame with spring hinges. Ball tipped cable temple pieces allow these glasses to be very comfortable yet remain securely in place. This set of glasses features 13 pairs of interchangeable lenses so you will have one that are suitable in any lighting condition. 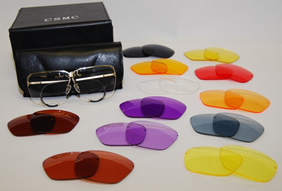 Each set of glasses is in a handy clip on carrying case with enough space to store 2 extra pairs of lenses. The other 10 pairs of lenses are packaged in a soft folding case. Both the lens case and the carrying case fit conveniently in the large storage box. Convenient storage pouch for 10 pairs of lenses. Special soft padded lining to help prevent scratches or damage to the lenses. This pouch is small enough to take with you in your range bag. Clip on Carrying case with space for you glasses and 2 additional pairs of lenses. 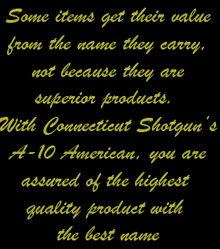 For more quality Connecticut Shotgun products, please click the picture below to look through our online catalogue or visit us at www.connecticutshotgun.com.